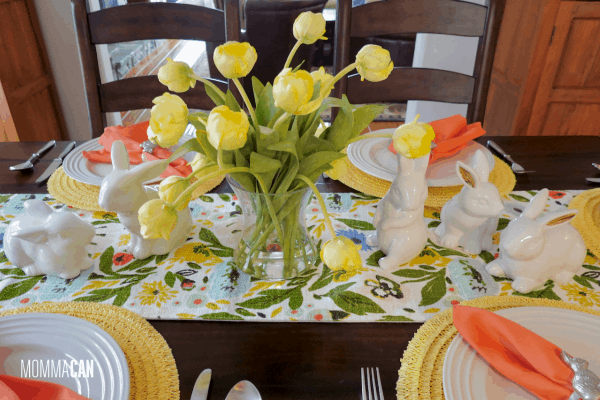 Our Simple Easter Bunny Tablescape with a collection of white bunnies and yellow tulips make a wonderful setting for our Easter brunch. Easter is just around the corner, and I have been so busy I have had no time to decorate! I set my timer and created a Simple Easter Easter Bunny Tablescape. Easter is a beautiful time to bring in joyful spring colors. I loved creating this table and using our ceramic bunny collection and a beautiful table runner. We are calling our setting Bunnies in the Garden. And yes, we have bunnies in our California backyard all the time. As a matter of fact, we have one bunny and a squirrel who hang out together every single day nibbling and foraging. I call them Frankie and Johnny! Every spring Target has cute little white bunnies. Many times they are in the bargain section at the front of the store. I have added a couple here and there every year. I think my storage trunk is officially out of bunny space. So this will be our last batch of bunnies. Not to worry! There are plenty around the house to celebrate Easter! Our Easter Spring Table Runner! I was browsing Target in my tired mom state. You know the drill. The thrill of alone time has warn-off and you realize you are going to now have to actually shop for the things your family needs. As I was headed toward the shampoo aisle my eyes caught a bloom of color. I was this amazing floral table runner from Opal House! I just love it and guess what. My husband actually noticed, which is a big deal. I mean he is not the type to look around the house for any kind of floral doodad that I have added to our decor. Yep, I am smiling. Complimenting the wonderful table runner I bought was a breeze. It is actually versatile enough to use all through spring and summer! 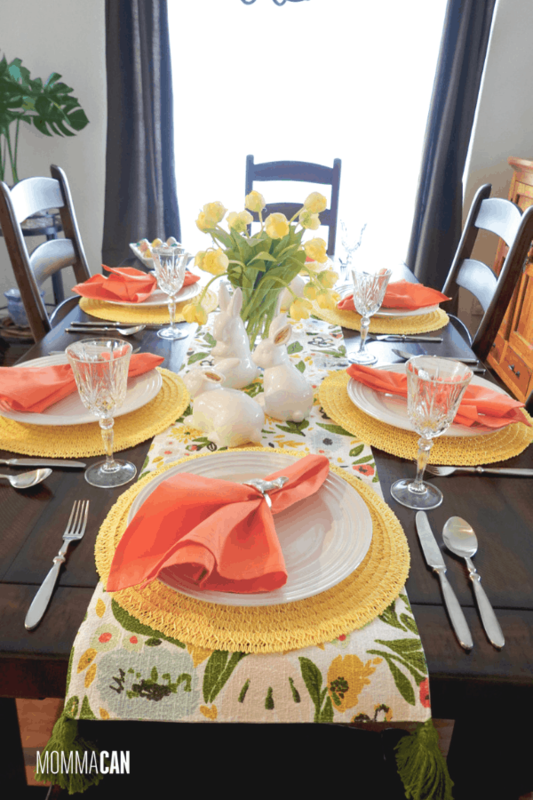 I chose yellow round table placemats and bright orange sherbert cloth napkins . 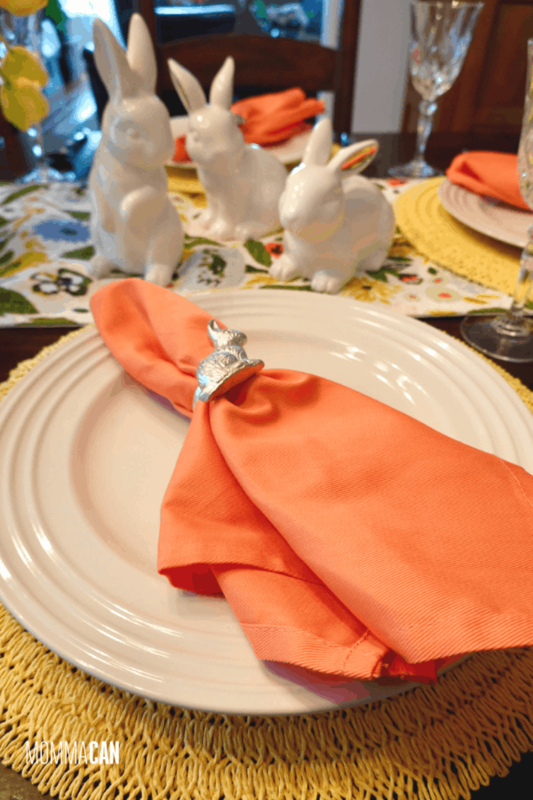 The bunny napkin rings are from last year! I still love them. I found the napkins at Homegoods. 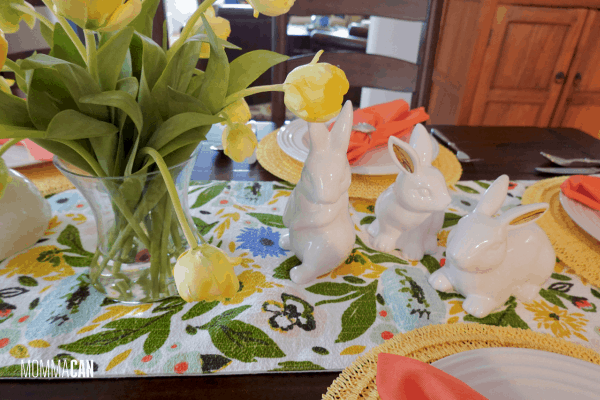 Easter decorating should be simple and easily repurposed for spring. 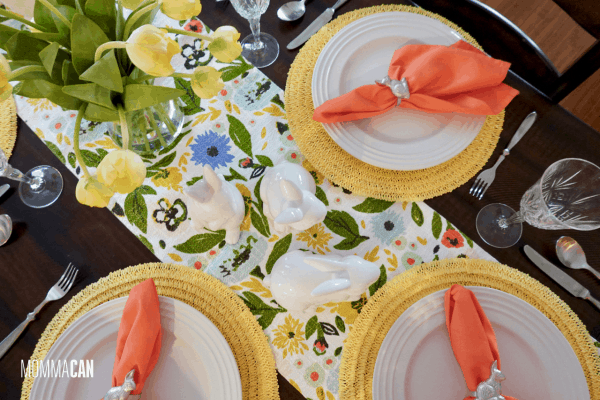 Our table runner and beautiful yellow tulips are perfect all season long. Our Easter floral centerpiece is a glass vase filled with lifelike butter yellow tulips. I bought these at Homegoods and they have lasted three seasons! For a special dinner, I will replace with a glass of the real deal. However, these are truly lovely! I enjoy keeping a basic white set of dishes for simple table settings. Crisp white words for any meal or celebration. Pictured are Le Cruset dinner plates. They are quite large. I often use these as charger with smaller luncheon plates. They have been a wonderful investment. I love the ridges on the plates, they make a wonderful contrast. However, I have used Dollar Store white plates for really large gatherings and they work beautifully as well. Most of these items are the ones I am using, however, some are just very similar. Come see our Easter Egg Decorating Party and Simple Plastic Egg Craft! 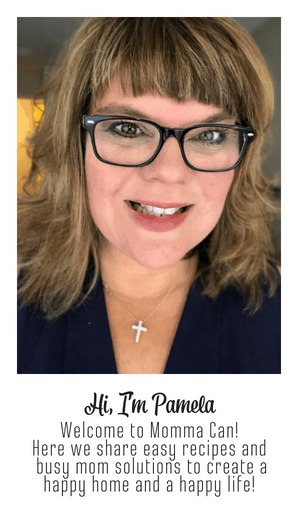 Easter Photo Ideas – Great List for taking pics of your little ones on Easter! 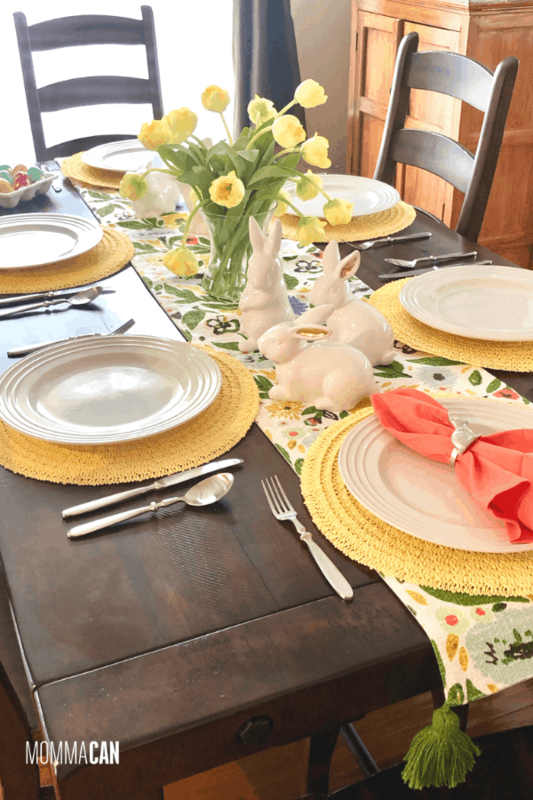 We really love our Simple Easter Bunny Tablescape. I love our theme of Bunnies in the Garden! 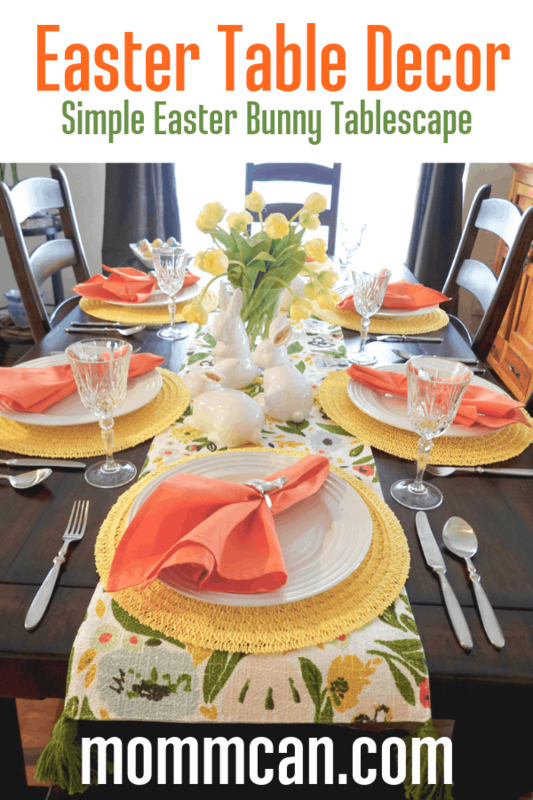 I hope you are inspired and create a beautiful simple Easter setting for your family! What a beautiful table. So springy and cheerful. I love it!